1967 Chevron started building cars with 1 litre / 61. cui “Screamer” motors to comply with the tertiary international Formula 3 regulations. A one off B9B with stressed panels incorporated into the frame was built at the end of 1968 and again raced by Peter Gethin who drove the car to a debut win. 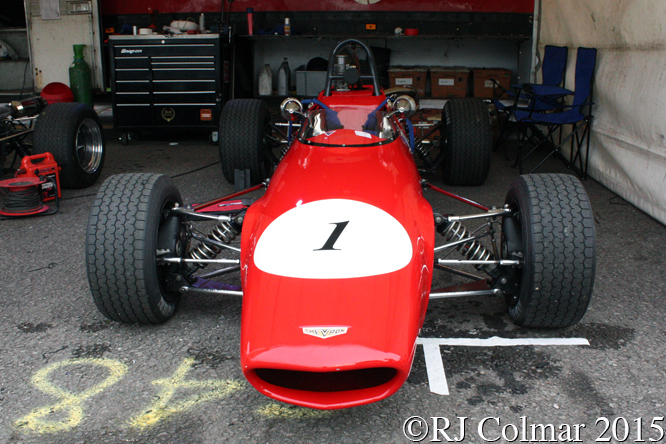 The following year Chevron built 14 production versions of the B9B known as the B15 and in 1970 9 upgraded Formula 3 cars followed known as B17’s. 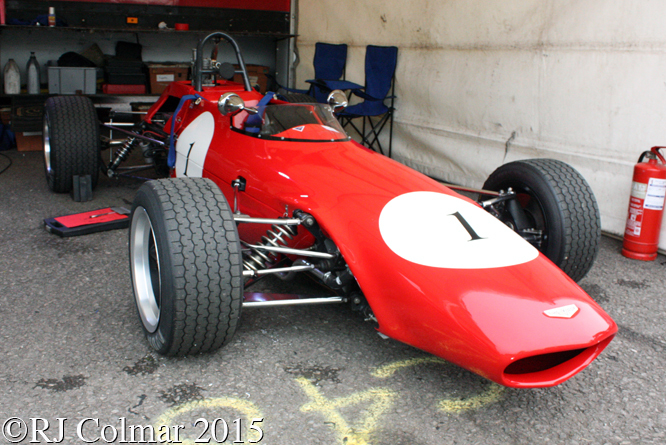 I believe today’s featured car seen in these photographs at the recent Grand Finals Castle Combe meeting where it was driven by Jim Blockley is the same car as that advertised by David Pullen in October 2013. 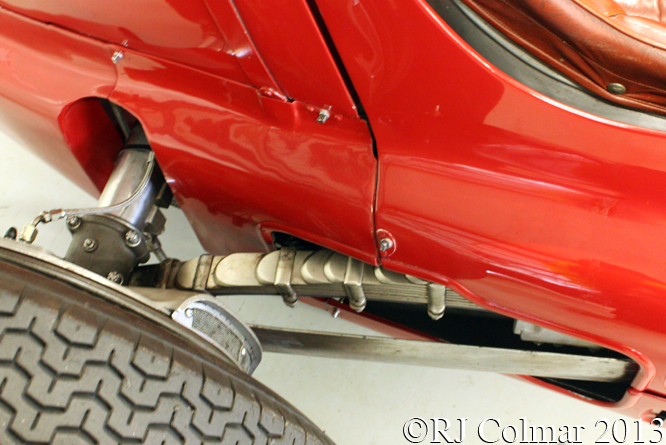 Distinguishing features include the one piece top body work from the back of the cockpit to the nose, the exhaust, and the universal joint with sliding spline driveshafts in place of the more common for the period Rotoflex driveshaft couplings. According to former Derek Bennett Engineering employee Kevin ‘Ossy’ Hodge, who was involved in building nearly all the B17’s, the car formerly belonging to David Pullen is the eighth Formula 3 B17 to be built and was originally supplied to Ken Sedgley. 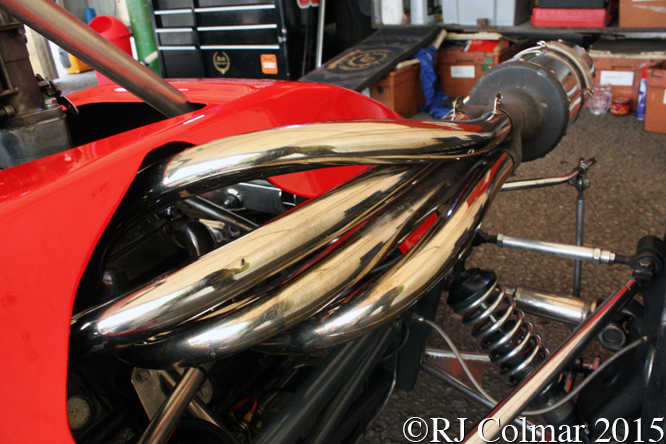 Kevin also established recently that unlike Chevron’s GT’s chassis frames for the B8, B16 and later B19 models which were built by sub contractor Arch Motors the frames for the open wheelers were subcontracted out to Racing Frames in Ware, Hertfordshire. 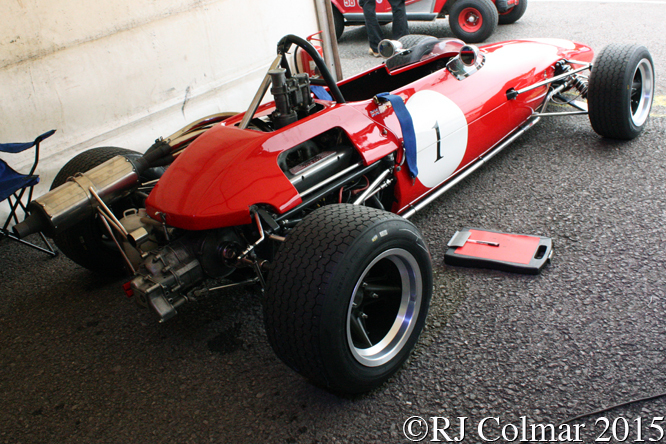 In his notes on Ken Sedgley’s B17, see note 13 on this link, Allen Brown records that #F3.70.08 was raced by Ken in Formula 3 and Libre events with Holbay motors and upgraded the following year with a 1600 cc / 97 cui Holbay motor compliant with the new for 1971 spec Formula 3. John Finch of Chesterfield bought and raced the car midway through 1971 and shared it with Graham Lynch in 1972, the following year a Formula Atlantic Spec production based twin cam was fitted and the car was raced in both Formula Atlantic and Formula Libre events. Alan Thompson bought the car for hillclimbing campaigning it in 1975 and 1976 which culminated in him securing the 1976 Scottish Hillclimb Championship. Russell Paterson acquired the car in 1977 but crashed it before it passed through the hands of Bobby Howlings and M Wakefield-Brand in 1978. 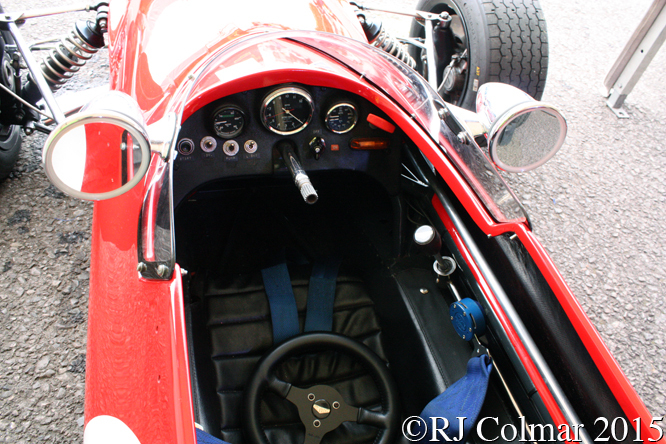 David Pullen bought the car in 1991 and in the spring of 2009 the car was significantly rebuilt with a 1964 to 1970 F3 spec 1 litre / 61 cui Holbay R70 MAE engine rebuilt by Stuart Rolt and Mk8 Hewland 4 speed gearbox by Cavan Riley. 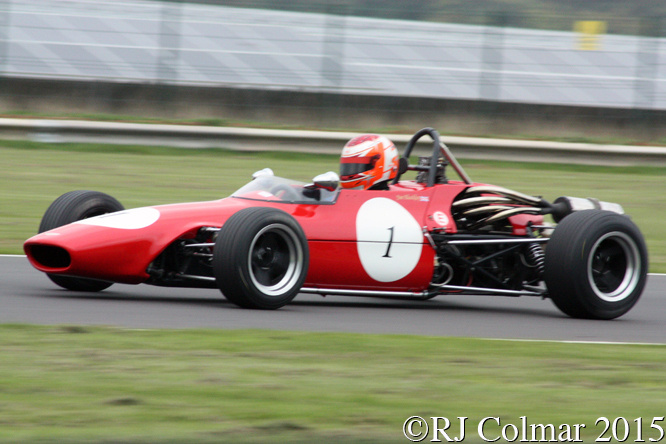 John Pearson raced this car in 2014 prior to selling it to Jim Blockley who raced a Brabham in Historic Formula 3 events up until appearing in the Chevron at Castle Combe. 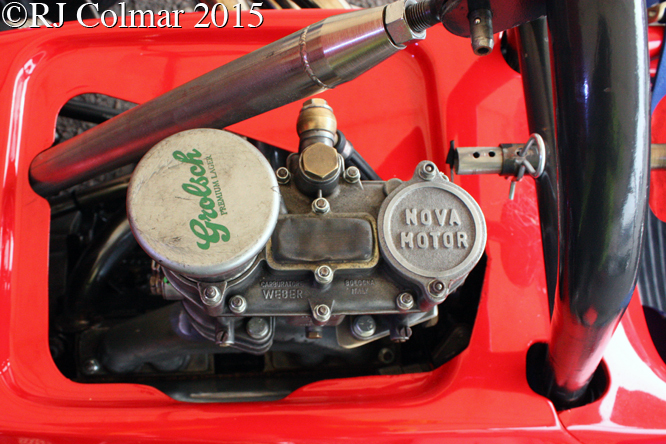 The 1964 to 1970 Formula 3 engine specs required the use of a production engine block and a single choke carburetor fitted with a 36mm restrictor twixt the carburetor and inlet manifold. The cylinder heads were free to be modified with gear driven cams replacing cam chains and dry sump lubrication for the crankshaft, the 1 litre / 61 cui Formula 3 motor’s were known as “screamers” because they could occasionally be buzzed up to 13,000 rpm with little or no damage. 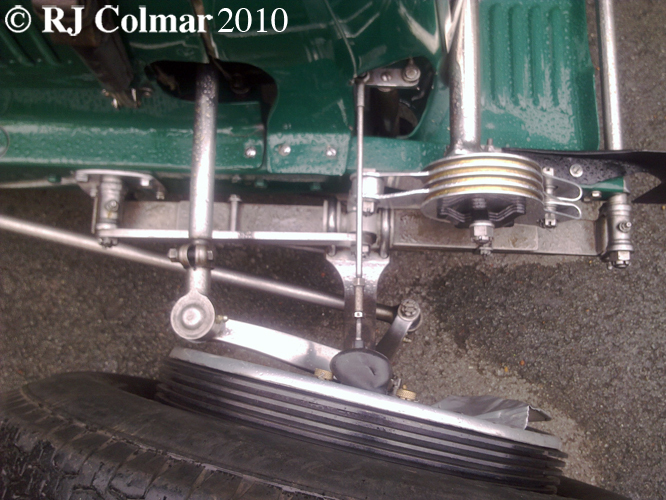 By far the most popular blocks used in the “Screamer” formula were the three crank bearing 105E and 109E blocks from Ford, Cosworth built a Modified Anglia Engine known as the “MAE” based on 105E but the term “MAE” appears to have carried over onto products for the same market from both Holbay and Novamotor who also used Ford 3 bearing engine blocks. 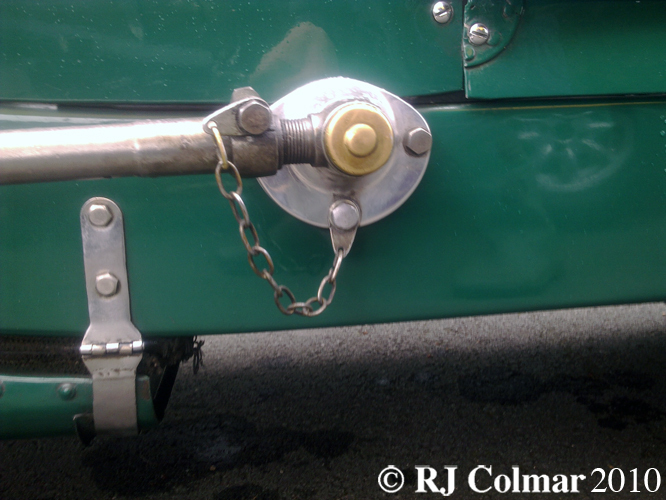 It was soon realised that the least resistance to flow was offered by a twin choke Weber IDA down draught carburetor with a blanked off choke, for which special inlet manifolds were built to fit engines that were tilted over at 30 degrees along the crankshaft axis in the chassis. My thanks to all who contributed to the B17 thread at TenTenths and to the Ford 105E thread at The Nostalgia Forum especially Snakedriver, Ray Bell, John Saunders and David Birchall who kindly answered my question regarding the use of the blanked off twin choke carburetors. Thanks for joining me on this “Scottish Hillclimb Champion” edition of “Gettin’ a li’l psycho on tyres” I hope you will join me again tomorrow. Don’t forget to come back now ! 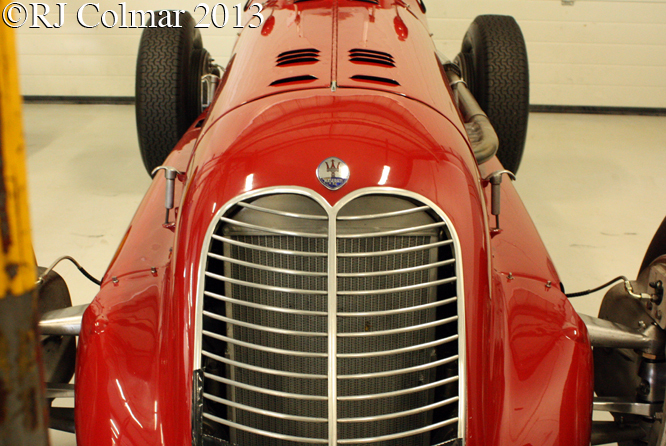 This entry was posted in Uncategorized and tagged B17, Bennett, Blockley, Brand, Brown, Castle, Chevron, Colmar, Combe, Finals, Finch, Ford, Grand, Hodge, Holbay, Howlings, Lynch, Paterson, Psychoontyres, Pullen, Ralph, Riley, Rolt, Sedgley, Thompson, Wakefield, Weber on November 14, 2015 by Ralph. Fed up with the German Silver Arrow’s from Mercedes Benz and Auto Union stealing their thunder and pride the Italian Motorsports Authorities decided to cut Alfa Romeo and Maserati some slack by announcing that all of the Grand Prix run on Italian soil in 1939 would be for 1.5 litre / 91.5 cui Voiturettes which would exclude the German monsters that had been sweeping all before them in the top European open wheel series since 1935. 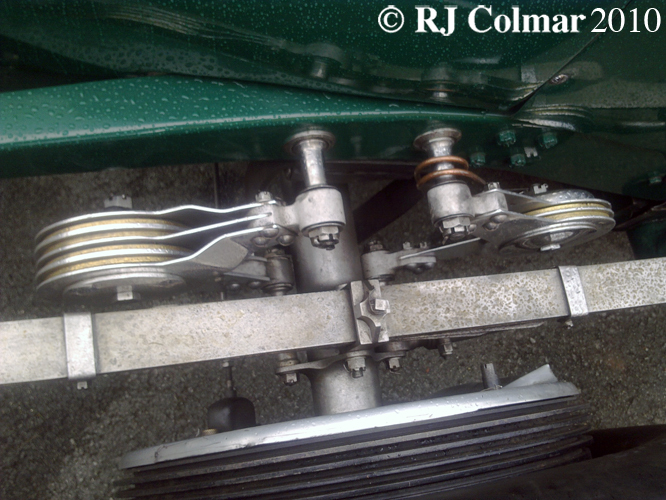 To take advantage of the new rules Ernesto Maserati designed a new 4 cylinder motor with bore and stroke dimensions roughly equal, known as square bore though the cylinders were of course round, and with four valves per cylinder to replace the 6 cylinder 12 valve motor fitted to the previous moderately successful 6CM. To handle the extra 30 hp of the new motor the 6 CM ladder chassis was moderately upgraded; with more use of aluminium, repositioned suspension to lower the chassis and the track was nearly 2″ wider. For the Tripoli Grand Prix, effectively on Italian soil since Lybia was an Italian colony at the time, Maserati produced one 4CL with a streamlined body for Luigi Villoresi to drive. 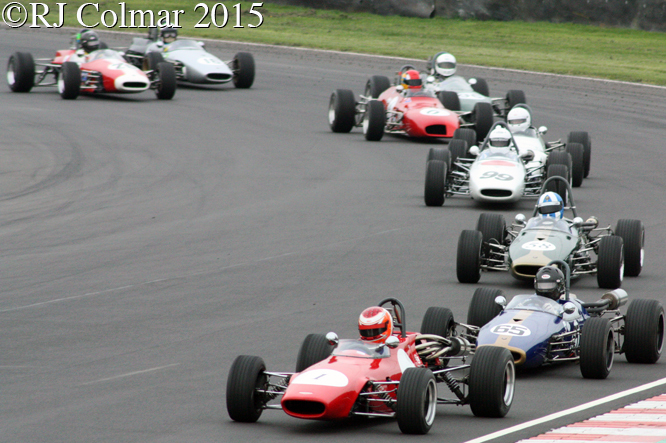 Luigi qualified on pole in the race, generally regarded as having the finest field of voiturettes ever seen. However both Luigi and the other two 4 CL’s including #1566 seen here, driven in Tripoli by Giovanni Rocco retired leaving, Mercedes Benz to an uncontested victory with two W165 cars they had built in secret, much to the dismay of the Italians. Fortunately the W165’s, having made their point, were never to race again leaving Jonnie Wakefield in a private 4CL to score 3 victories to which the works team added 2 more before the outbreak of hostilities in the 1939/45 war. Luigi Villoresi driving a 4CL won at Targa Florio against opposition only from Axis aligned countries in 1940 and Giovanni Rooco driving #1566 finished third in the same race to record his best result in the car before the war. 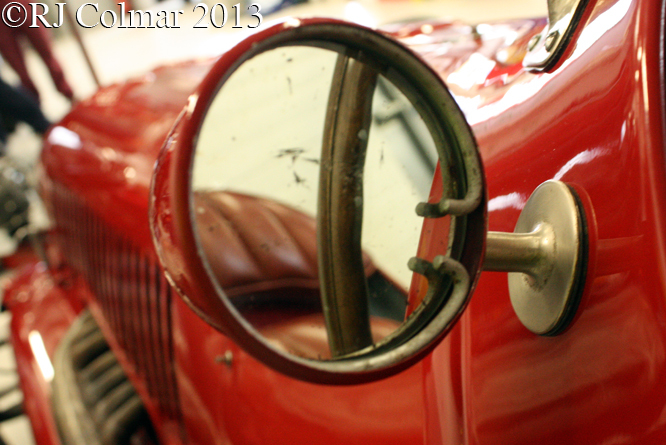 After the cessation of hostilities #1566 found it’s way to France where it was acquired by Robert Mazaud, a driver who set a lap record in the Le Mans 24 Hours, on his debut there, aboard a Delahaye in 1938. Robert would score his best result aboard #1566, 3rd at St Cloud in Belgium, a few weeks before being killed after an accident at the wheel of #1566 in the Nantes Grand Prix in France. Raymond Sommer, Tazio Nuvolari and Giorgio Pelassa all drove 4CL’s to victory in 1946, but it was 1947 when the 4CL really came on song with 10 victories to the models credit. Luigi Villoresi won 6 races with; Nello Pagani, Reg Parnell, Yves Giraud-Cabantous and Christian Kautz each winning one a piece. To the best of my knowledge Jean Judet entered #1566 in at least six events between 1946 and 1950 recording at least five retirements. 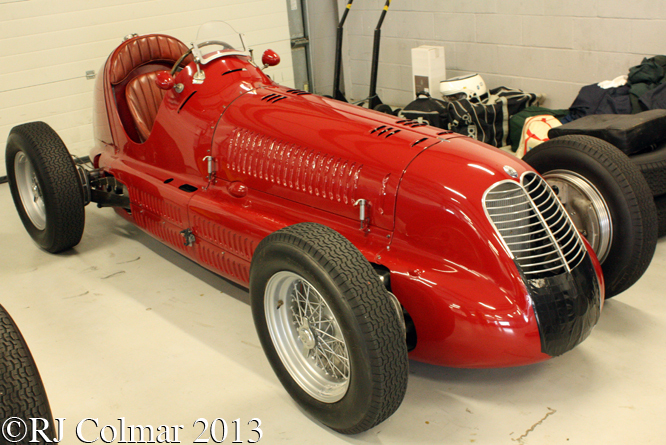 In all 15 4CL’s were built between 1939 and 1946, I believe #1566 seen in these photographs, at the HGPCA Test Day at Silverstone last year, has belonged to the family of the late Rodney Smith since 2004. 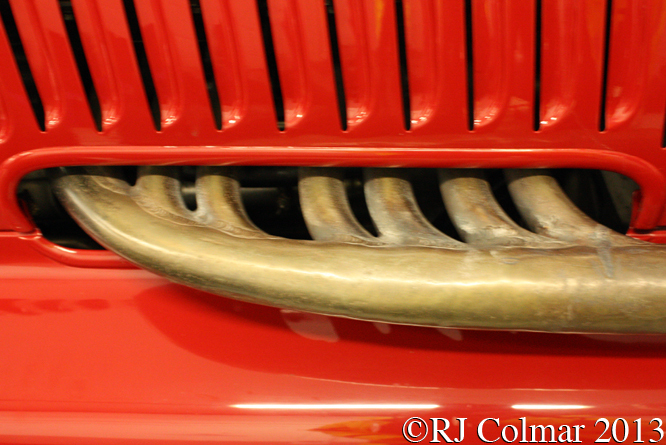 Thanks for joining me on this “4 Pot Square Bore” edition of “Gettin’ a li’l psycho on tyres”, I hope you will join me again tomorrow for a look at a Bugatti. Don’t forget to come back now ! 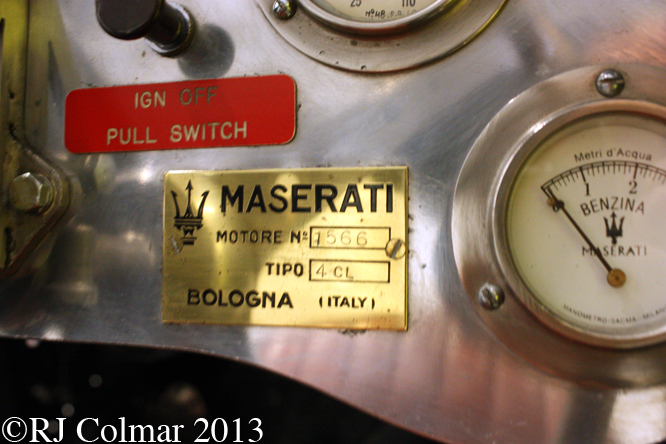 This entry was posted in Uncategorized and tagged 4CL, Colmar, GALPOT, HGPCA Test Day, Judet, maserati, Mazaud, Nuvolari, Pelassa, Ralph, Rocco, Silverstone, Sommer, Villoresi, Wakefield on May 19, 2014 by Ralph. English Racing Automobiles was founded by driver Raymond Mays, designer Peter Berthon and financier Humphrey Cook in 1933 to manufacture racing cars capable of upholding British prestige in Continental European races. 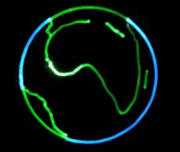 Without the financial or engineering resources made available to Mercedes Benz and Auto Union in top flight Grand Prix races, ERA focused their efforts one step down, in the GP2 or Indy Lights of its day known as voiturette racing for vehicles with supercharged motors from 1.1 litres / 67 cui to 2 litres / 122 cui. The ERA engines came in three sizes and were based on a 6 cylinder Riley production block with a stronger crankshaft and entirely new aluminium cylinder head. 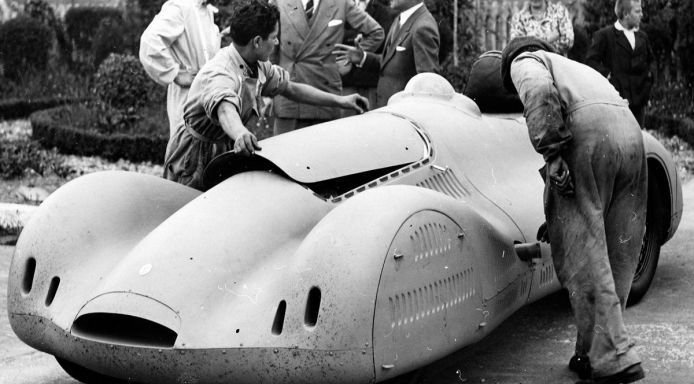 Chassis design was by Reid Railton and the body work was by George and Jack Cray to a design by a Mr Piercy who like Railton had been responsible for the design of Malcom Campbells land speed record breaking vehicle ‘Bluebird‘. 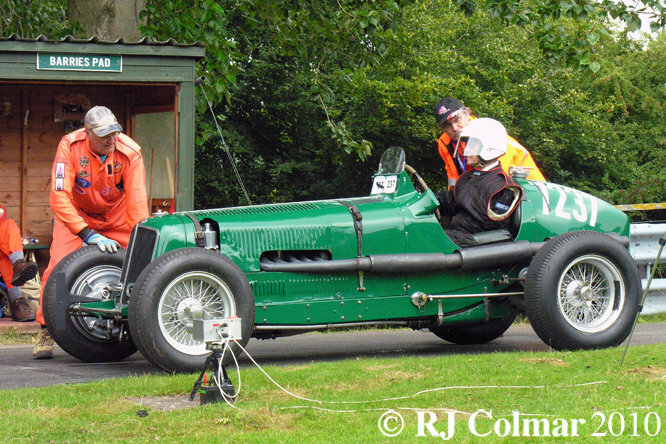 ERA R14B seen here is the 14th and final original ‘sit up and beg’ originally a pale blue vehicle built in 1938 with a 1.5 litre /91 cui Zoller supercharged engine for Johnnie Wakefield who won the 200 mile race at Brooklands and finished third in the 1938 Bern GP. 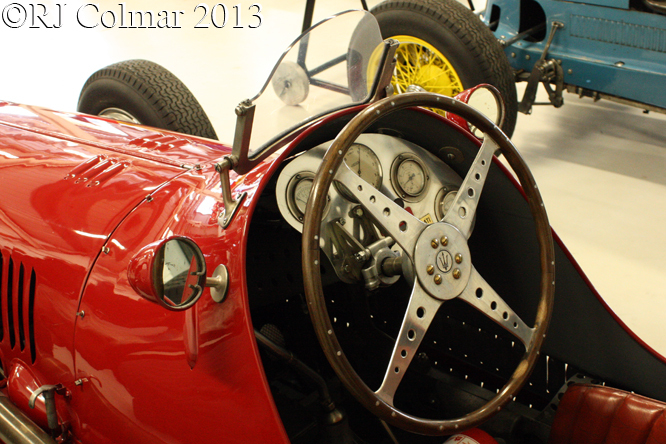 Bob Gerard acquired the car after WW2 and scored third and second place finishes at the British Grand Prix of 1948 and 1949, he continued to race the car successfully until 1956. 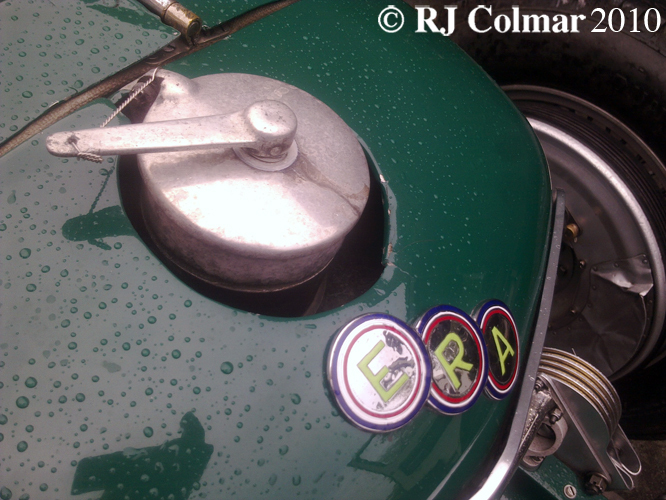 Current owner Donald Day purchased ERA R14B in 1958 and has raced it with a 2 litre / 122 cui motor in place of it’s original 1.5 litre 91 cui unit. In 1990 14B appeared for the first time in British Racing Green. 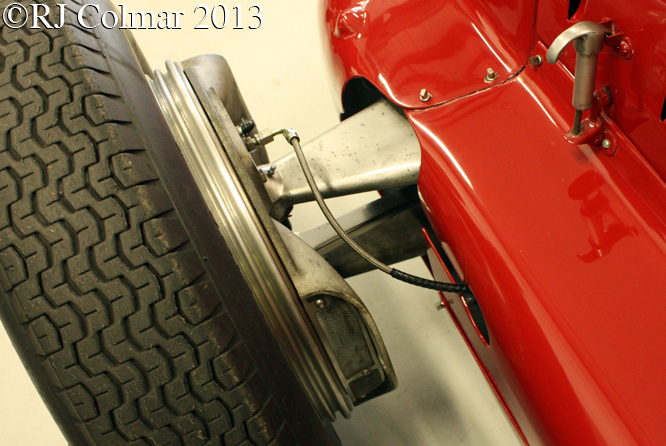 This same vehicle was driven to victory in the pre 1959 Historic Grand Prix at Monaco by Julian Bronson in 2002. 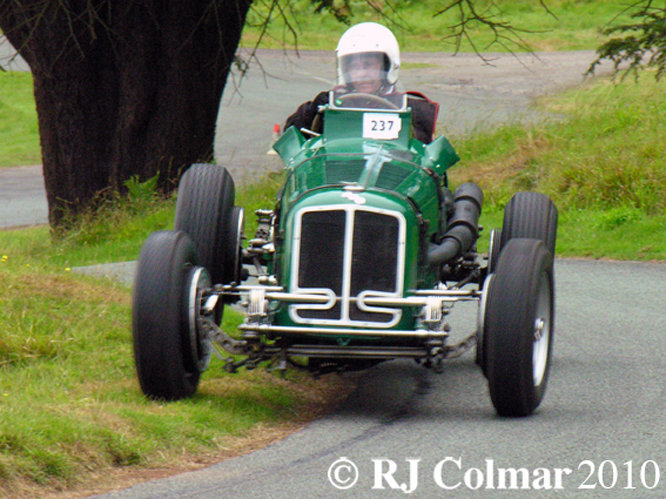 All photo’s bar the penultimate one from the September VSCC meet at Loton Park, the penultimate one was taken at the August VSCC meet at Prescott. 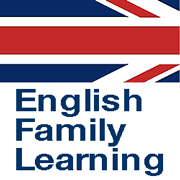 Thanks to David Hodgkinson for back ground information on ERA 14B. 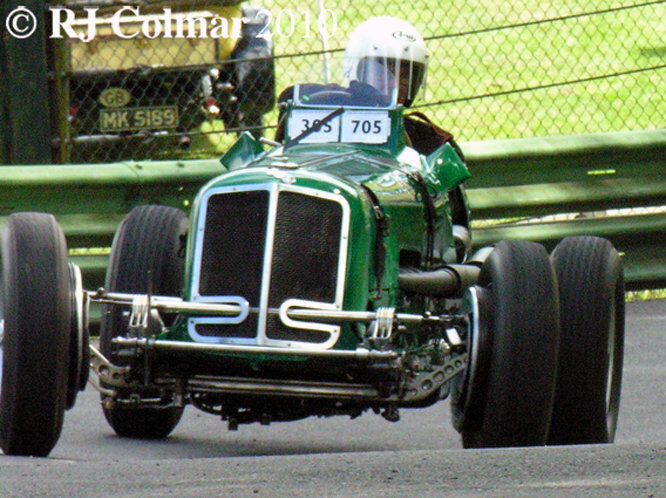 Hope you have enjoyed todays British Racing Green edition of ‘Gettin’ a lil’ psycho on tyres’, and will join me tomorrow for a look at a high flying special. Don’t forget to come back now ! 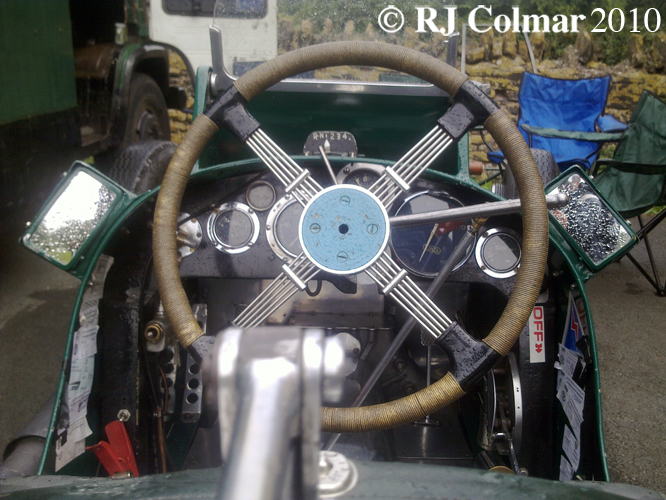 This entry was posted in Uncategorized and tagged Art, Automobiles, Bluebird, Bronson, Cook, Cray, Day, English, Gerard, Humphrey, Mays, Piercy, Psycho, Racing, Railton, Raymond, Riley, Tidesco, Tyres, Wakefield on December 21, 2010 by psychoontyres.